Michael Pearce’s assured feature debut Beast is a clever, feral psychological horror that constantly surprises. Beast is a strikingly shot, cleverly scripted, unsettling study of troubled psychology in the pressure-cooker claustrophobia of a small island. It’s set on Jersey, and written and directed by Jersey native Michael Pearce. It’s loosely inspired by past events on the island, though he’s created a tense and memorable film that transcends its origins. Jessie Buckley is pellucid as troubled Moll, her face a battleground of emotions, the vibrancy of her corkscrew red curls making her stand out from the community around her. Though an adult, she lives with her snobbish middle class family – her controlling mother (a nicely judged performance by Geraldine James, alternating between sneering threat and sickly charm), her Alzheimers-suffering father and a sister who upstages her, even at her birthday party. When she meets a “bit of rough”, loner Pascal Renouf, a lithe young poacher with sun-kissed skin and curls (Johnny Flynn), the animal magnetism between them scandalises everyone Moll knows. At their first meeting she’s wearing a yellow dress like the Disney Beauty and the Beast image. Moll is lonely and Pascal seems to be the only person who really understands her. There’s a serial killer of young girls (the ‘Beast’) loose on the island and Pascal becomes a suspect because of his criminal record. But Moll too has violent incidents in her past that still haunt her. As their relationship develops and we learn more about them, Pearce subtly shifts suspicion back and forth between them as he ramps up the tension. Both Buckley and Flynn subtly convey ambiguous and at times extreme emotions beneath the surface. Two attractive young people don’t look like the serial killer stereotype. But could either or both of them actually be the Beast? Could one of them be in danger from the other? It’s Pearce’s first feature film, yet it’s assured and well crafted on different levels as it unwinds like a dream or a nightmare. 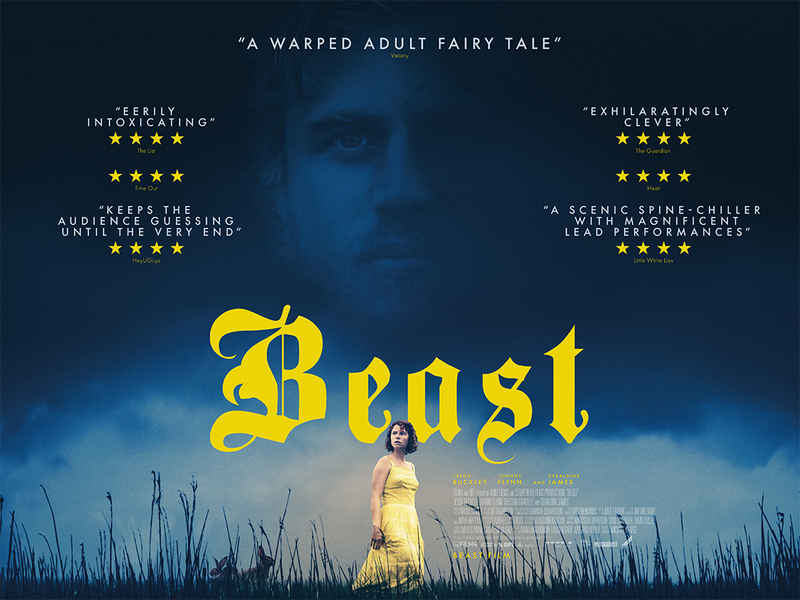 Beast is many things – a fragmented psychological horror/thriller, a character study of Moll, whose unreliable viewpoint dominates, a powerful evocation of primal sexuality (conveyed by how people smell) and beautiful cinematography of a scenic island setting that both symbolises restriction and also creates the desire to escape, either literally or metaphorically. It’s unsettling, surprising and unpredictable right up to the end – not chained by any genre – and it won’t be easily forgotten. Beast premiered in the UK at the 61st BFI London Film Festival and is released on 27 April 2018 in the UK.